Broadbent's parents, a woodworker and sculptress, were amateur actors who co-founded a theater group in Lincolnshire. Their love of performing was passed on to their son, who was often in trouble for making smart aleck remarks to teachers. He was expelled from high school for drinking beer, and later dropped out of college after deciding that an ordinary career would be too dull. Instead he entered the London Academy of Music and Dramatic Arts, and upon graduation, unable to find steady work on stage, he worked as a theater's assistant stage manager. In desperation, he signed up with the Ugly Model Agency, a "character agency" that specializes in securing odd-looking people for advertising work. Broadbent says the Ugly Agency never found him work, but his luck at theater auditions soon improved, and eventually acting paid Broadbent's bills. 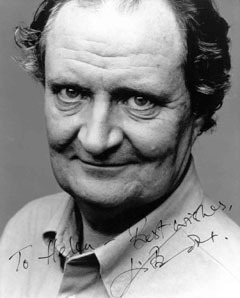 Broadbent had accumulated a respectable résumé as a stage actor before making his first film (1978's The Shout). British television viewers remember him as the star of The Peter Principal, a BBC sit-com about a bank manager promoted beyond his ability. He first came to American attention as the plastic surgeon stretching Katherine Helmond's face in Terry Gilliam's masterpiece, Brazil. Broadbent was also in the awful Superman IV, and Neil Jordan's art-house hit The Crying Game. He was Renée Zellweger's father in the Bridget Jones movies, Boss Tweed in Martin Scorsese's Gangs of New York, and he was the lyrical half of Gilbert & Sullivan in Mike Leigh's Topsy-Turvy. He won his Oscar for Iris, playing Judi Dench's doting husband as her character faded away with Alzheimer's Disease. He has starred twice in excellent films with Jane Horrocks. In 1990's Life Is Sweet, Broadbent plays her father, and Horrocks an intensely alienated girl with an eating disorder. In 1998's Little Voice, she was again intensely alienated but this time with an enormous musical talent, and he was the cabaret owner and master of ceremonies.